Smart Cooks' Best Investment! 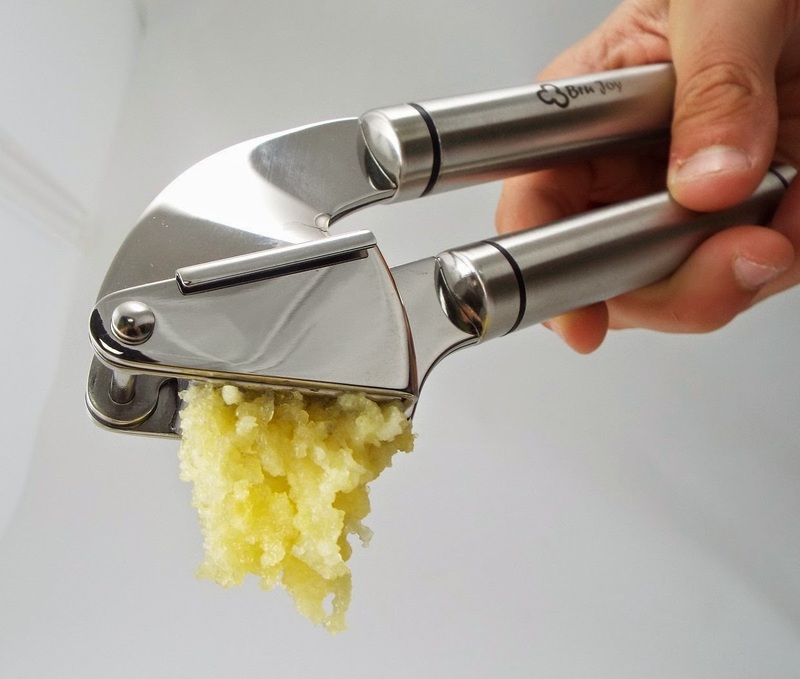 With Bru Joy Garlic Press, Crushing Garlic Cloves Is As Easy As 1, 2, 3! No more stinking hands! Imagine, you are busying cooking and need to add some juicy garlic mince into that yummy dish. 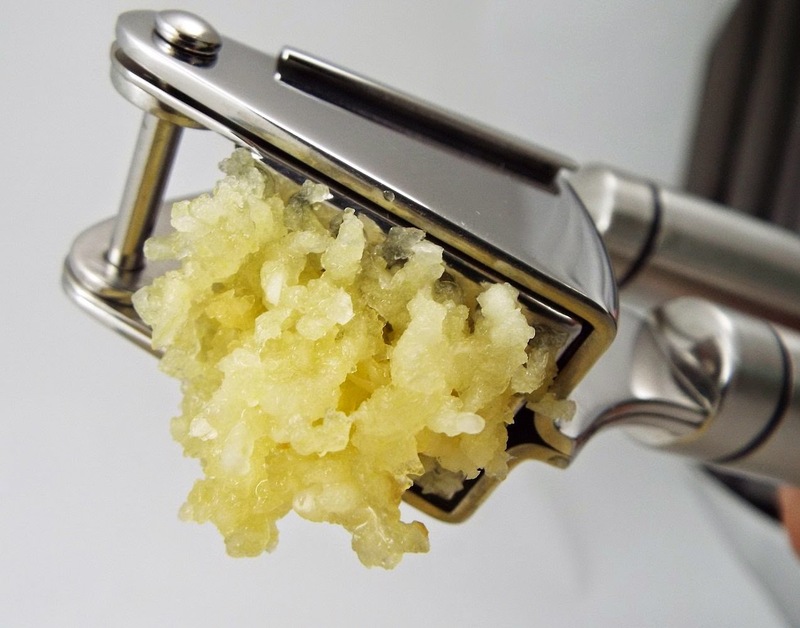 You simply pop in an unpeeled garlic clove into Bru Joy Garlic Press' big garlic chamber, press the two easy-grip-handles to give it a good squeeze, beautifully crushed garlic mince all coming out from the holes effortlessly. You flick open the mince head to take out the skins and give the chamber a quick rinse or pop the garlic press into dish-washer. That's it! You enjoy fresh garlic pulp with a breeze! 1. Saves you money. Made of unbreakable, heavy duty stainless steel from head to toe, Bru Joy garlic press is the last garlic press you ever need to buy! 2. Saves you time: Producing juicy garlic mince in seconds. 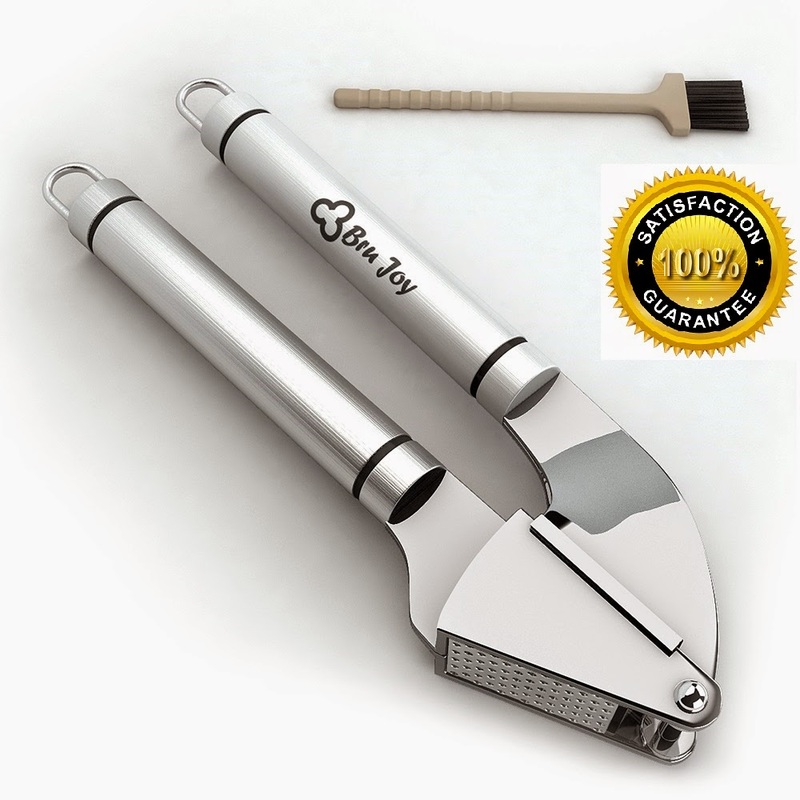 Bru Joy Garlic Press is extremely simple to use. 3. Easy to clean Not only dishwasher-safe, best part is that the mince head flicks open for easy skins- removal. 4. No more smelly hands - you don't need to peel garlic anymore! 5. The end of bland cooking. Add hassle free fresh garlic to your meals everyday! This is a very handy little gadget! It's pretty easy to use, very durable, great quality and should last a long time. It's not the easiest thing to clean by hand, but it's not bad. The brush really does help, but in general, I still prefer the dishwasher. It is very sturdy and big enough to fit a lager clove. Although, for a bigger clove it was easier for my husband to use because it does take a little muscle to press... I needed to use both my hands to press, but the design of the product is great because it doesn't hurt my hand to crush the garlic. I just cut the clove in half and problem solved. It is also stated that you don't need to peel the garlic clove, but in my experience, I would not recommend that. The first clove always seem to come out smoothly but a good amount of the skin and some of the garlic was left trapped in the holes. I just figured pressing the second one would push the remaining left overs out, but it just made it harder to press the second clover through. Granted, it could just be me, but I personally still like to peel first. It made it a lot easier for me. Overall, I really liked it and it works very well. Well worth the price believing this garlic press will last me for years to come. Would definitely recommend! If you would like to try it out for yourself, you can purchase the Bru Joy® Best Stainless Steel Garlic Press with Cleaning Brush right now from Amazon! 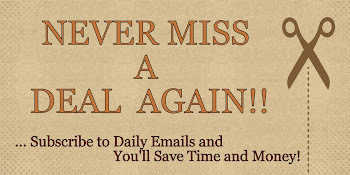 Plus, exclusively to my readers, use this secret promo code: SAVE10GP for 10% Off!